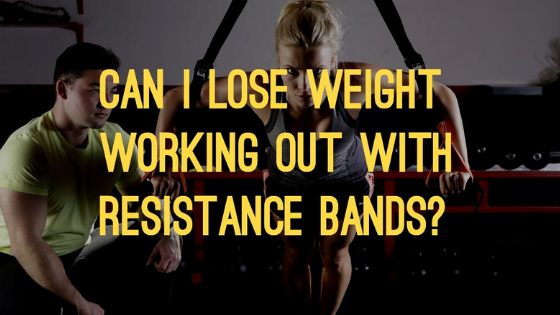 Can I Lose Weight Working Out With Resistance Bands? This isn’t the first, nor will it be the last time that I will sing the praises of using resistance bands. They help you gain strength, functionality and flexibility. Today’s article, however, is about how they help you lose weight, so keep reading! Resistance bands are lightweight, inexpensive and portable. You can take them anywhere and use them wherever you want. They can be used with or without door attachments, offer multiple resistance options and there are several styles available depending on your budget and fitness needs. You can bring them to work and get a few exercises in while you’re on the computer or to the park and do a total body routine. You can take them with you while you travel, use them at home and have a few sets available if you want to include some friends to join you in your workout. The fact that these bands are so user-friendly is helpful in weight loss because anything that makes movement convenient is an asset to those wanting to be fit, active and yes, LEAN. Here are some examples of how to work out with the bands at the office during your workday. This video is loaded with useful exercises, stretches and clear explanations and demonstrations. I have written a lot about the benefits of multi-muscle group exercises. When looking to maximize caloric burn, especially when time is limited, you want to get as many muscle groups going at one time as possible. Working out with resistance bands allows you to combine exercises using your upper and lower body while working your core as well. You can do a squat/row combination and work your quads, hamstrings, calves, glutes, mid back, back of the shoulders, biceps and forearms…all in one exercise with one lightweight piece of equipment. To see what this looks like, check out the demonstration. Make sure your knees don’t go past your toes and if you aren’t used to doing squats, try only lowering yourself halfway and progress from there as you build strength. In life we move in many directions using all areas of the body, so using resistance bands not only helps you get lean and shapely, but they also enable the flexibility to incorporate functional movements that will help you become more proficient in some of your daily activities. An example of this would be doing a one-armed rotational chest press with a staggered stance (as shown in the video below). This is a great way to work your chest, shoulders and triceps while at the same time promote ease in everyday movements such as pushing a vacuum. To incorporate more core stability in the same exercise, use a parallel stance instead (legs hip to shoulder width apart) which forces your abdominals to contract to keep the bands from pulling you back. Now while you can use the bands with or without a door attachment as demonstrated in the first video, I would highly recommend getting at least one set that has this. With a door attachment, you can hook the bands up high, down low or at mid-level to enable an abundance of available movements. Whether you use resistance bands, dumbbells or simply your own body weight, the keys to weight loss are intensity, effort, and consistency. Work hard, put in the time and do this on a regular basis and you will keep yourself connected to the process. You’ll find that the same philosophy goes for any desired outcome in life.